Paper Crafts by Candace: Let It Snow! Let It Snow! I created this card by using Die Cuts With a View paper for the background. 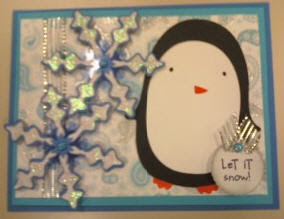 I used Joys of the Season cricut cartridge to create the penguin and the snowflakes. I used white paper for the snow flakes and then inked it with silver ink and then used clear stickles. The "Let it Snow" saying is a stamp. Thanks for looking!